This award is named after the first Chief Scout Executive of the Boy Scouts of America who exemplified Ralph Waldo Emerson's observation that "an institution is the lengthened shadow of one man." Scouting today is the "lengthened shadow" of more than three decades of the farseeing and dedicated leadership of Dr. James E. West. The James E. West Award is a national recognition for individuals who contribute $1,000 or more in cash or securities to their local council endowment trust fund. The 1910 Society was named in recognition of the year in which the visionary early leaders founded the Boy Scouts of America, which was patterned after the fledgling, but popular, Scouting program developed in England by Lord Baden-Powell. Those who make a gift to The 1910 Society further endow Scouting and are themselves modern-day visionaries. It is appropriate, therefore, that these visionaries be recognized as they help ensure the Scouting legacy for future generations of young Americans by undergirding the financial stability of the BSA programs in the local council in the twenty-first century. Named in honor of the year in which the Boy Scouts of America was founded, the 1910 Society recognizes endowment gifts of $25,000 or more to a local council endowment fund. The early founders of BSA had the vision and commitment to make Scouting the number one youth organization in the world. 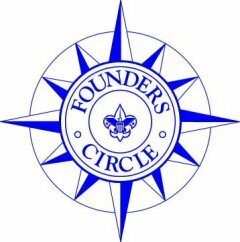 In that spirit, we honor the modern-day visionaries who qualify for the Founders Circle in their commitement to perpetuate the visions and beliefs of those founders. Unlike the other endowment awards, major donors may qualify for Founders Circle membership with a deferred gift. This includes charitable remainder trusts naming the council, wills, lead trusts, gift annuities, and other types of large gifts. This level of endowment recognition, the Founders Circle, is intended to recognize deferred gifts designated for council endowment funds.